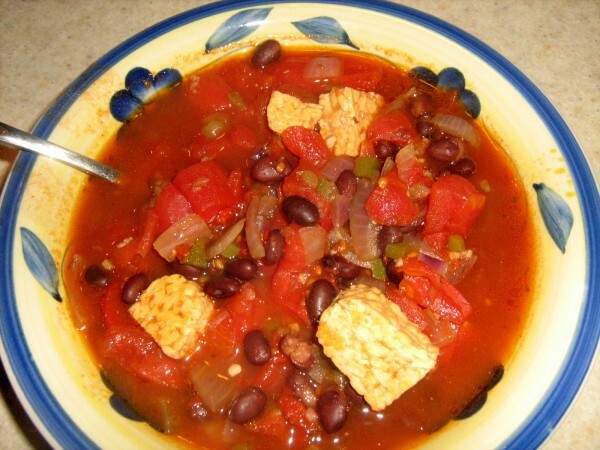 Spicy Vegetarian Chili, according to Courtney Hartman, is a thick chili and can be served over pasta or top with shredded cheese if desired. Another way we love to serve vegetarian chili is over a bowl of brown rice and topped with steamed broccoli florets! And we happen to know from experience that Courtney likes HOT chili! So she has a caveat regarding hot sauce...but use it if you like it hot too! Tip: I dice onion and all peppers, plus drain and rinse all beans before warming the oil. In large stock pot, heat extra virgin olive oil on medium. Add onions and stir until onions soften. Add green and red peppers and jalapenos. Allow a few minutes for peppers to cook. Add chili powder, garlic, salt and pepper. Stir. Add kidney beans, garbanzo beans and diced tomatoes. Stir and let simmer for 45 minutes for flavors to mingle. (Add hot sauce at any time if more heat is desired).